Bureau B presents the third release in its Kollektion series, a volume highlighting the music of Populäre Mechanik, the 1980s post-punk/jazz project of Ton Steine Scherben founder Wolfgang Seidel. 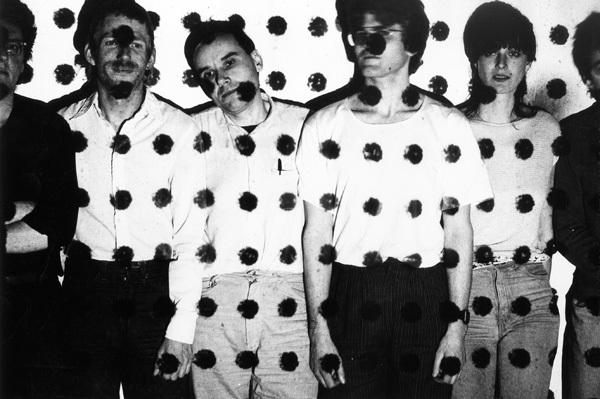 Seidel describes the development of Populäre Mechanik after his departure from Ton Steine Scherben: "The music of Ton Steine Scherben soon lost its fascination for me, so before long I quit the band. I was far more intrigued by the music performance club Zodiak Free Arts Lab run by Beuys student Conrad Schnitzler. The Zodiak had one white room and an empty black room, the latter used for concerts. And what concerts they were! A poster announced: 'Totally free music. Everyone plays. Anyone plays. Everyone can do it.'... I teamed up with Schnitzler, but there was no room for a drum kit in his little studio. Instead, I started playing around with synthesizers and transposed the rhythms I had played on drums, prompting Schnitzler to nickname me 'Sequenza.' As the years passed by, however, I started to miss the drums, so in the late 1970s I replied to a small ad and found a few musicians roughly the same age as me. Our stories were similar, having begun with rock music in the 1960s. We were not the kind of folk who wallowed in nostalgia, having grown disenchanted with the direction rock had taken. Rock was clearly developing into a soundtrack for squares. Punk was far more attractive to us. It reminded us of the 1960s, rather to the annoyance of the punks. Still, we maintained a certain distance. We shared punk's dislike of the way rock and roll had developed, but beer-fuelled nihilism was not our style. Devo and XTC were the kind of bands we really got excited about. And there were also jazz musicians who wanted away from the entertainment circuit for sophisticates. These two ingredients blended into the music of Populäre Mechanik... The band's strategy for resisting assimilation into any scene was the creation of a cassette label -- allowing us to release our music quickly and cheaply. With a 4-track tape recorder and a healthy appetite for experimentation, we jammed endlessly ages before selecting the most interesting recordings." This collection, curated by Palais Schaumburg founder Holger Hiller, includes tracks from two Populäre Mechanik cassettes from the early 1980s, never before available on CD or vinyl. The accompanying booklet includes Hiller's interview with Seidel, in which they discuss the function of rock and pop music over the past 45 years. LP version. Bureau B presents the third release in its Kollektion series, a volume highlighting the music of Populäre Mechanik, the 1980s post-punk/jazz project of Ton Steine Scherben founder Wolfgang Seidel. Seidel describes the development of Populäre Mechanik after his departure from Ton Steine Scherben: "The music of Ton Steine Scherben soon lost its fascination for me, so before long I quit the band. I was far more intrigued by the music performance club Zodiak Free Arts Lab run by Beuys student Conrad Schnitzler. The Zodiak had one white room and an empty black room, the latter used for concerts. And what concerts they were! A poster announced: 'Totally free music. Everyone plays. Anyone plays. Everyone can do it.'... I teamed up with Schnitzler, but there was no room for a drum kit in his little studio. Instead, I started playing around with synthesizers and transposed the rhythms I had played on drums, prompting Schnitzler to nickname me 'Sequenza.' As the years passed by, however, I started to miss the drums, so in the late 1970s I replied to a small ad and found a few musicians roughly the same age as me. Our stories were similar, having begun with rock music in the 1960s. We were not the kind of folk who wallowed in nostalgia, having grown disenchanted with the direction rock had taken. Rock was clearly developing into a soundtrack for squares. Punk was far more attractive to us. It reminded us of the 1960s, rather to the annoyance of the punks. Still, we maintained a certain distance. We shared punk's dislike of the way rock and roll had developed, but beer-fuelled nihilism was not our style. Devo and XTC were the kind of bands we really got excited about. And there were also jazz musicians who wanted away from the entertainment circuit for sophisticates. These two ingredients blended into the music of Populäre Mechanik... The band's strategy for resisting assimilation into any scene was the creation of a cassette label -- allowing us to release our music quickly and cheaply. With a 4-track tape recorder and a healthy appetite for experimentation, we jammed endlessly ages before selecting the most interesting recordings." This collection, curated by Palais Schaumburg founder Holger Hiller, includes tracks from two Populäre Mechanik cassettes from the early 1980s, never before available on CD or vinyl. The accompanying booklet includes Hiller's interview with Seidel, in which they discuss the function of rock and pop music over the past 45 years.